Awaken Your Amazing Creative Powers Within! This hypnosis session + binaural music session, is a very special tool to allow you to push the boundaries of your mind. It will help you completely open up the possibilities that lie within the most amazing computer in the world - the human mind. It is designed for anybody who wishes to experience amazing new levels of creativity, perfect if you are a writer, artist, musician, student, or simply just a dreamer wishing to come up with that one big idea to set you up for life. The program works in 2 main parts, both contained on separate MP3 tracks for your convenience. 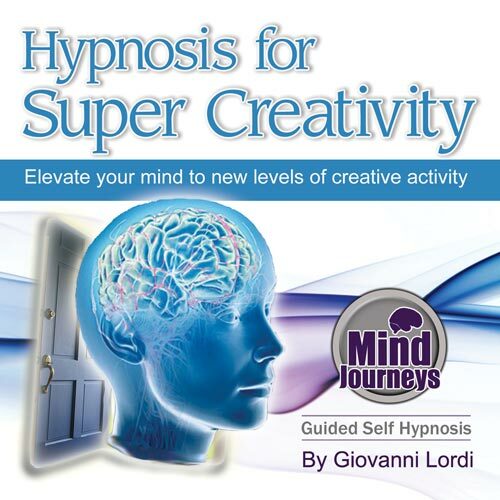 This is a hypnotherapy session spoken by Giovanni, recorded in full high definition audio with a special brainwave entrainment background soundtrack. It is designed to activate through direct suggestion & metaphors, the limitless potentials within the deeper parts of your mind, and allow you to bring these to your conscious attention whenever you need to. This part of the program contains no spoken word or subliminal messages, just brainwave entrainment frequencies of binaural beats, trance tones & nature sounds. It is designed to be listened to at a low volume through headphones when you are in the process of creating something or coming up with ideas. The music will entrain your mind into a specific 10Hz level of Alpha trance, a state of brainwave resonance where your creative mindset is heightened. This is what is referred to as the zone of 'Super Learning' during the spoken hypnosis session, & using this track you will be able to put your mind into the exact level of trance conducive to focus, concentration, freedom & the flowing of information.